uPVC Conservatory Paint Spraying in Nuthall, Nottingham. Did you know about uPVC Conservatory Paint Spraying? Brown is no longer modern & to replace could be very expensive, the cost-effective alternative is to have it sprayed. When we spray from brown to white it’s a three sometimes a four coat procedure. 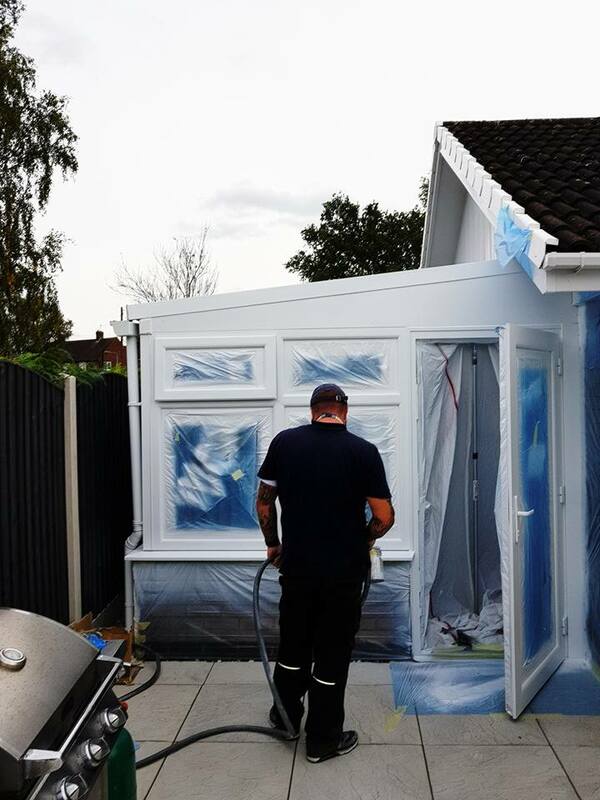 You can see one of our spray technicians coating the conservatory firstly in grey. Once it is dry we then start the build-up of white coats. 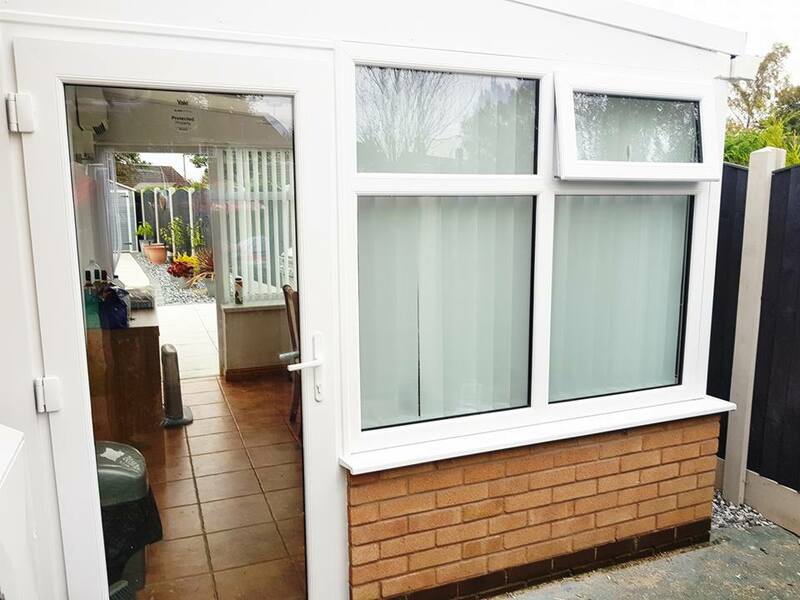 This conservatory looks fantastic after four coats of specialist uPVC Spray Paint. You would think this is New seeing it for the first time. 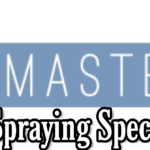 The Spraymasters provide high-quality onsite uPVC paint spraying services. 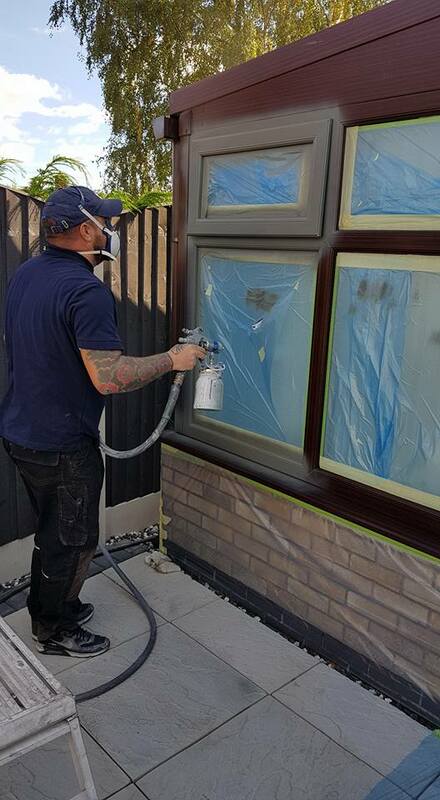 We also offer in-house spraying at our Langley mill Base. Our quotation process is very thorough & professional give us a call to arrange your free site survey, once we have been out and done a measure we will email you all the information. You can contact our friendly sales team direct on telephone number 01246 897043 or mobile 07740772992, we will happily arrange a visit to call and see you at your home. Why not check out our videos on YouTube YouTube – uPVC Spraying – We have some promotional videos on Youtube where you can see us transforming homes in the Nottingham & Derby areas. We also travel nationwide to carry out onsite spraying works. Please feel free to take a look, the channel is updated regularly. 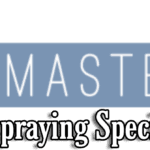 10-year guarantee on all specialist coatings applied by the SprayMasters.